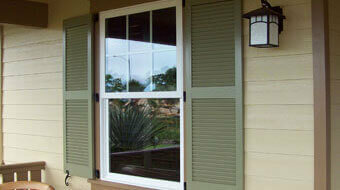 We offer a large selection of high quality, custom exterior shutters at prices to fit most budgets. Choose from exterior wood, composite, and vinyl shutters in a range of styles, sizes, and colors, all covered under warranty. Any of our shutters can be fitted with your choice of decorative vinyl or wrought iron hardware. We'll handle your shutter job from start to finish, including custom installation services, and your satisfaction is guaranteed. You can rely on Castle Shutters; our family-owned and -operated local business has more than 29 years of experience installing the finest exterior shutters throughout Southern California at the most competitive rates. Call us today; we offer free in-home estimates for shutter sales and installation.